Larry Levinson, NBC and I presume Universal Studios (Florida, I believe) are continuing NBC’s commitment to Sunday night mega-disasters, and this latest effort, 2 parts (starting tonight), “The Storm”, directed by Bradford May, doesn’t exactly do the Universal Valkyries global trademark any good (I’d go back to “Magnificent Obsession” to rebuild this studio’s pride). Nor does it recall the mood of Tchaikovsky’s late overture by that name. As is so often the case, there is a renegade-refusnik government plot to win these wars like Afghanistan by using satellites to reflect laser beams to create storms. That’s the stuff of Dyson spheres in sci-fi – maybe concentrated laser beams in space could drill worm holes in space-time. But here the result is snow in the Mojave Desert (which may happen anyway – it was around 20 deg. Fahrenheit in Yucca Valley at night in February 2002 when I stayed there), and people freezing to death locally in the middle of highland heat waves. Pretty soon we have an accidental manmade hurricane, which turns into a Category 5 that destroys Miami (it could turn further north and aim at Universal studios instead). The whole idea now seems preposterous. I you want a similar miniseries, try “Ice” on ABC in 2001 as I recall. I must say, however, that in the early days of the Cold War, these kinds of miniseries actually worked. I remember, for example, “The President’s Plane Is Missing” around 1971. Now they seem like potboilers. Today the Weather Channel featured a one-hour program on the Greensburg KS May 4 2007 tornado, on “When weather changed history”. The early part of the documentary shows the weather map that night. “It’s springtime in Kansas, and that means tornadoes”. There is a low pressure system to the SE, and a dry line, and tornadoes form on it. 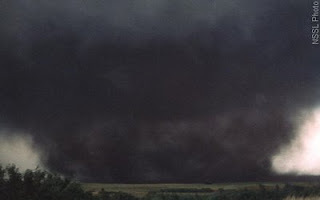 One of them dawdles and grows into a wedge tornado, a mile and a half wide, and turns slightly to the north, hitting Greensburg directly. Multiple tornadoes linger in that area of the Midwest for three days around a slow moving low. Because of the efficiency of the warning system, there were only 11 deaths. Later the town rebuilds green, and Leonardo Di Caprio comes to town to help make a multiple-part documentary on the rebuilding, reviewed here on my TV blog. There is the comment “this town’s main export is its kids”, but at least one teen (Taylor Schmidt) becomes a star in the Di Caprio film; for younger people a disaster can turn into a career-defining opportunity. The town develops some social cohesion as people live in the trailers or “FEMA-ville”. The film briefly describes the new jobs that green industries will create. Attribution link for Wikimedia picture of wedge tornao in Oklahoma. Apparently our efforts to blow up an incoming asteroid just break it into many more dangerous “pieces”. It’s pretty amazing who the remnants of the rock pick out the most spectacular targets on earth. There is some of the usual stuff – the president declares martial law, and there is, my goodness, rationing as well as an economy. In a parody of the generational wars, an elderly woman is told she can’t have any fresh fruit (a pear); it is saved for the kids who still have their lives ahead of them (it’s no longer her turn, I guess). They say it will take decades to rebuild basic infrastructure. The real question is whether the world really could get ready to deflect a big asteroid, and whether we really can see all of them in near-Earth orbits. Could we do multiple launches to hit multiple pieces, or to bump one super piece out of trajectory? “Thinks will get back to normal – until next time” (2027, according to the film, which happens in 2010). There was a film by the same name in 1979 from American International (of course! – that studio gave us “Born Losers”), with Sean Connery. It gets aired now and then. 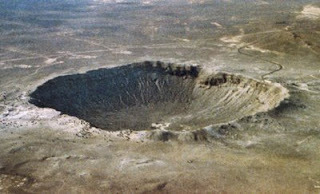 Attribution link for USGS picture of Meteor Crater in Arizona. In 2005, BBC, with director Tony Mitchell, made a two hour television film “Supervolcano”. The film traces a seven-day supervolcano eruption from Yellowstone, viewed from a British scientist who is researching geology in Yellowstone when he is “trapped” here by the catastrophe. 80% of the United States is severely affected, with half a million deaths, and 20% of the country made uninhabitable by ash fallout. The film shows whole American cities (in the Rocky Mountain area) destroyed and people living in shantytowns at the very end. The film consists of two one-hour parts and has been posted on YouTube (with each part itself in six 10-minute segments, which can become confusing) by Brainf55. I don’t know whether it’s authorized by BBC or not, so I didn’t embed it, but here is the link to the last (and most telling) segment. Here is BBC’s own descriptive link for the program. The narrative style of the film is declamatory and tends toward exaggeration. At one point, USGS scientist William Liebermann (Sam Charles) objects to being asked to mute the truth to quell public panic. The supervolcano eruption occurs in stages, starting with smaller “Mt St. Helens” eruptions and leading to the Big One(s). The film was also shown on the Discovery Channel in the US in 2005 as well as in Britain on the BBC. The August 2008 issue of National Geographic has an important article by Joel Achenbach, “When Yellowstone Explodes,” online link here. The magazine has a fold out that diagrams the multiple magma chambers below the caldera, a kind of Jules Verne “Center of Earth” concept. One concern is that our 600000 year waiting period may be over, although others still downplay the risk will play out any time soon in current history. 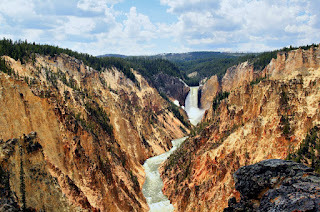 Wikimedia attribution link for Yellowstone Canyon. photo above. "Around Venus By Balloon": Is French short subject a warning about runaway greenhouse effect on Earth? A group from France called the European Venus Explorer offers a 7 minute film called “Around Venus By Balloon,” (2004) directed by Maarten Rove, with Colin Wilson and Ian Davison. The film can be found and downloaded from here and will play readily in Quicktime or Real Player. The film starts out with a brief primer on hot air ballooning on Earth (indeed, recalling Jules Verne perhaps) and then simulates a week-long blowup around Venus at 60 kilometers elevation, where the temperature is about 70 F and the pressure ½ of the Earth’s. One the surface, the pressure is 92 atmospheres and temperature 900F, hot enough to melt lead. The atmosphere is so thick that a beam of light might encircle the planet, and an astronaut could see the back of his pate. What happened is that most of the carbon on Venus got released into the atmosphere, rather than getting bound into the ground. That is a tragedy. One paper here suggests that were Mars and Venus to have switched positions five billion years ago, they might both have life and be real competitors of Earth – maybe a solar system economy rather than a global one. That’s because a smaller planet might have stayed at the right temperature and pressure closer to the sun, and a bigger one in Mars’s orbit could have stayed warmer. Other accounts say that Venus once had water, and maybe even life, maybe even a civilization, and then a catastrophic runaway greenhouse effect occurred, maybe over a short time like a hundred million years or so. Perhaps the surface of Venus is so volcanic that the surface turns itself out – more or less the same as a “supervolcano” megadisaster on Earth. The clouds contain sulfuric acid, evidence of super volcanic activity. The warning for earthlings is that maybe the same thing could happen to us, unexpectedly, at least on paper, in a sci-fi or Ion channel film. 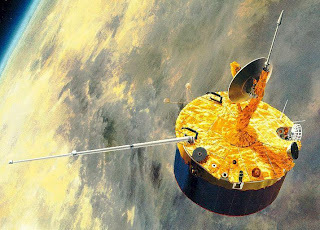 Attribution link for NASA picture of Venus Pioneer.